DEMONS, AND GARGOYLES, AND FRANKENSTEIN’S MONSTER…. OH, MY!!! It’s alive! It’s Alive” such are the iconic words that everyone automatically thinks of when talking about Frankenstein. Originally published in 1818 and created by Mary Shelley, this fictional tale of a strange scientist named Victor Frankenstein, who creates (through his scientific experiments) a horrifying monster has become a well-known literary classic worldwide. Given its popularity, various film adaptations have been created over the years featuring Frankenstein’s iconic monster as the result has been a mix bag of sorts (whether good, bad, corny, or even downright bizarre). Now Lionsgate and the producers of the Underworld series take a stab at Mary Shelly’s infamous monster in I, Frankenstein. Does this film resurrect the monster to new cinematic heights or has time officially running out for Victor Frankenstein’ menacing creature? Taking place some two hundred years after the events from Mary Shelly’s Frankenstein, Frankenstein’s monster (Aaron Eckhart), who goes by the name of Adam, has survived and has somewhat changed over the years (For the better), but still ambiguous with his humanity or his purpose in life. 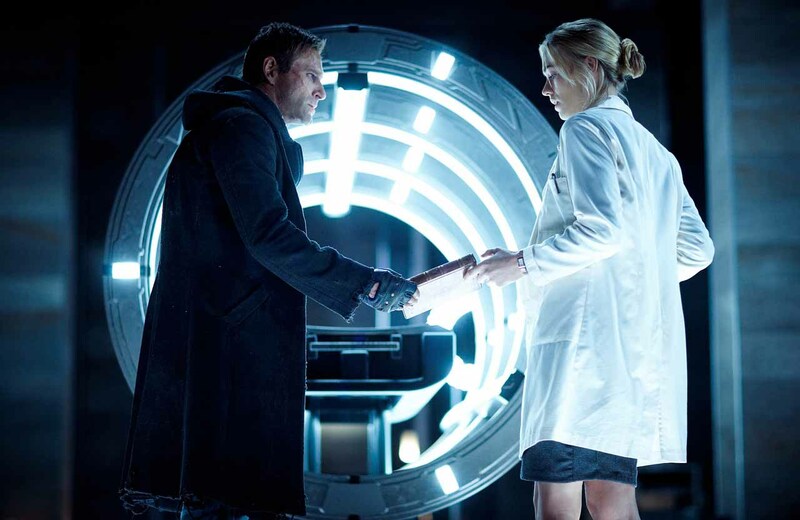 That all changes, however, when he meets Terra (Yvonne Strahovski), a scientist who is trying to figure how the key to reanimating life, and gets caught by in the age old conflict between gargoyles and demons. Adam soon discovers that he himself is the key that Terra has been searching for and, unbeknownst to her, that her boss is the demon prince Naberius (Bill Nighy) and has vile ambition to unlock the secret within Victor Frankenstein’s monster. Happy Halloween, everyone! Or just “Happy normal day” if you’re not reading this beyond the date of this initial postdate. I decided to revisit another one of my old movie blog posts for Halloween 2016, choosing my review of I, Frankenstein to tweak and revaluate. Enjoy! The movie is directed by Stuart Beattie, who mostly has contributed to screenplay writing Hollywood movies like Australia, G.I. Joe: Rise of Cobra, and several of the Pirates of the Caribbean movies, making I, Frankenstein his sophomore feature film (his first one was 2010’s film Tomorrow When the War Began). After reading the summary above, it’s obvious that I, Frankenstein’s plot isn’t a masterfully crafted story, and yet feels different from the other incarnations of Frankenstein. Like similar movies (i.e The Underworld films), I, Frankenstein offers a more fantastical approach to its source material, using the premise of Frankenstein’s monster in a world of fantasy horror creatures (i.e. the gargoyles and demons). It’s not exactly a fresh or innovated take or presentation, but it’s still somewhat entertaining and bit intriguing to the fantasy / horror genre. That being said, its narrative falls into the pattern of being predictable and is filled with gaping holes that you simply just have to accept as the story unfolds. The story also seems a little bit silly, to certain degree, if you think about it. A long war between demons and gargoyles and the key to turning the tide in the war is Victor Frankenstein’s monster, who looks like a scarred up Abercrombie model (beyond his prime) and has superhuman strength to boot. In truth, the film’s overall tone is a bit campy, which can be a bit tedious, boring, and you have to suspended your disbelief a few times to make sense of certain events / scenes. Again, this isn’t the most compelling work dreamt up by Hollywood. Take that all into account and it does border the line of being ridiculous. Aaron Eckhart’s portrayal of Frankenstein’s monster (Adam) is generally good, although the character doesn’t require a high caliber level actor like Gary Oldman or George Clooney to play the role. You do get a little more insight to the monster of Frankenstein in his struggle to find his place in the world, but not enough for his “Humanity” to surface within his once lifeless body. Speaking of humanity, the film is almost completely absent of humans entirely and our only really connection to human kind (and reality, more or less) is in the character of Terra, a scientist, played by Yvonne Strahovski. She’s definitely ease on the eyes, but acts more like a plot point to help the story move along and offering little purpose to her character. 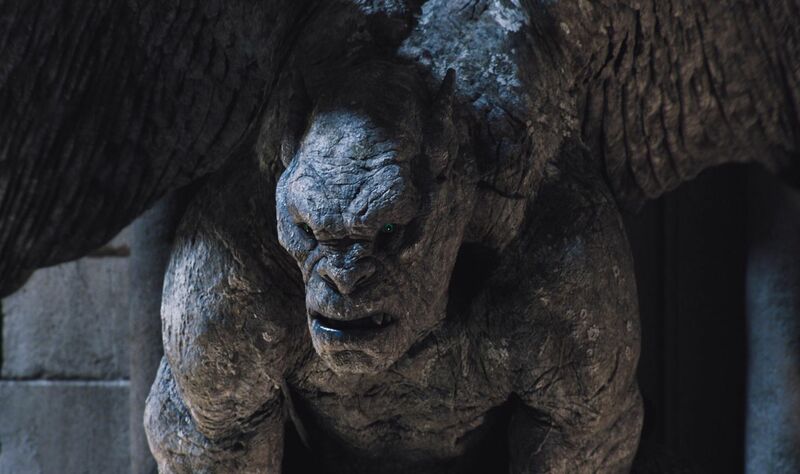 The gargoyles in I, Frankenstein are actually pretty cool looking with quite a bit of interesting back-story elements to go along with these celestial beings. Basically, the gargoyles are like angels; sent from heaven to earth to protect and silently (Taking the form the stone gargoyles to conceal their existence) defend humanity from the demons who want to enslave us. There’s two notably gargoyle character worth mentioning. The first is Miranda Otto, who most will remember her as Ewoyn from The Lord of the Rings films, plays the gargoyle queen Leonore and fairs the best of the cast when dealing with scenes with heavy-handed dialogued, especially with scenes dealing with Adam. The second is Gideon, Leonore’s right hand gargoyle warrior, played by Jai Courtney, who looks like a badass and fights like one too (shifting between his human and gargoyle form in thick of battle). The flip side of these beings are the demons, who like the gargoyles also take the façade of a human, as they’re less interesting compared to the gargoyles and comes across as generic baddies rather than complex villains. 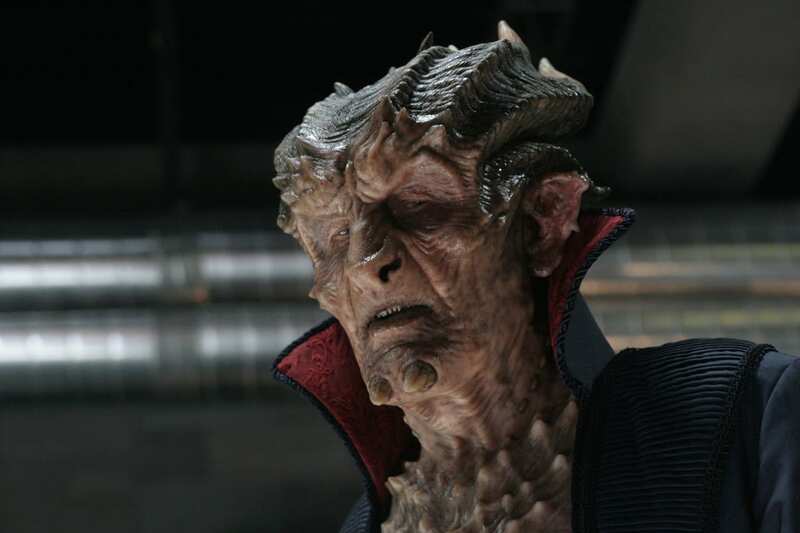 Even the make-up and design for their demonic faces looks dated and feeling reminiscent of an 80’s fantasy movie or from an old episode of the Doctor Who TV series. Bill Nighy plays the nefarious demon prince Naberius and while Nighy is a great actor, his character is too generic and flat to convey any sense of being a great villain. Luckily, I, Frankenstein’s saving grace is in its action and there’s plenty to good around. With a visually flair of demons bursting into flames or Gargoyles being enveloped in a radiant light, some of the best scenes in the movie consist of Adam fighting various demons and gargoyles; going blow for blow with each other in fanciful chorography fighting and gothic-like set pieces. And yes, Aaron Eckhart does punch a gargoyle right in the face (totally epic). I, Frankenstein adds a new twist to the tale of Victor Frankenstein’s creation; one that builds upon its original story and dives head first into the fray of fantastical action scenes and heavy-handed mythmaking of good and evil. Yet, the film is tainted by its predictable plot points, devoid of the “Human” element in its narrative, and, to simply put it, not strong enough to be compared with its original source material or its legacy. To me, the film was mediocre and pretty unmemorable and forgetful. The movie might appeal to some (those who enjoyed the Underworld series or Van Helsing), but, for most (including myself), I, Frankenstein will be a derivative and haphazard flick that can’t find its proper footing nor a cognitive sense of the man behind the monster. I’ve got to be honest and say this film looks kinda awful. Oh, I know. I mean it add some fun / creative moments, but totally forgetful! I remember seeing Frankenstein from 1931 in school a long time ago but I just didn’t like the movie so I never saw any Frankenstein movie again. It’s creepy! I do like your review though, very nice and interesting! Yeah, I too remember seeing the 1931 Frankenstein in school as well. Never a super huge fan of Frankenstein myself. Yeah, this movie’s just painfully dull. Nice review. Yeah, it was. I saw it back when it first came out in 2014 and I haven’t seeing it since. Totally forgetful.